Merida is so close to being my favourite princess (my pride won’t let me relinquish my hold on Kida, despite the fact that she does NOT get to fight the ultimate battle). Merida is outgoing and adventurous on her own. Mulan has to learn to fight and travel, Pocahontas traveled but didn’t fight. Merida LOVED these things! She wasn’t afraid to get hurt or push her limits. She didn’t make a fuss over her complexion have a scar on her face from her arrows. And she fired so many arrows that they’ve left a scar! …… I find scars attractive, btw. She’s more action and fire but learns when those things won’t work and learned how to be diplomatic, fair, and orderly, not for herself, but for others. I think she’s going to be a true diplomat and great leader, having the skills of both her mother and father. Rapunzel I felt was too stretched- she could bake, paint, make candles, SO many other things (and I understand, she needed ways to relieve boredom) but it made her WAY too perfect and kind of all over the place without something special to her (which was probably the painting and lantern thing). 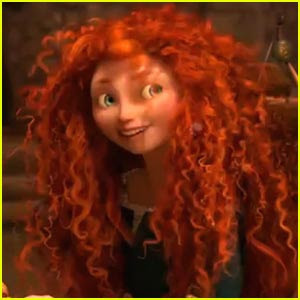 Merida could shoot and wield a sword (not a treasure house of weapons), ride, take care of her horse, and rockclimb. She might also have known how to bake, but she didn’t do it out of habit. She, as royalty (with the privilege of growing up royal) had to take lessons in all her other things that she learned and didn’t like it- music, oration, history. It felt much more relateable to me. She seemed a lot more human and her story seemed more realistic. Also, that accent. WOW that accent ❤ Scottish Highland accent, and the suitor who spoke but wasn't understood was speaking a Doric accent. 🙂 He had actual lines. I couldn't understand a word.